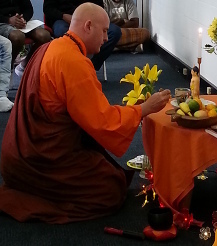 BuddhaName.org is home to the Buddha-Heart Fellowship of Tasmania. We are dedicated to Nien-Fo Ch’an (the unified practice of Ch’an “Zen” and Pure Land Buddhism), and the ideals of community service, and non-sectarianism. Buddha-Heart Fellowship is affiliated with CloudWater Zendo, the Zen Centre of Cleveland, Ohio, U.S.A. Copyright © 2013-2019 Venerable Shih Jingang. All rights reserved. Contents of this site may be freely copied for non-commercial purposes.